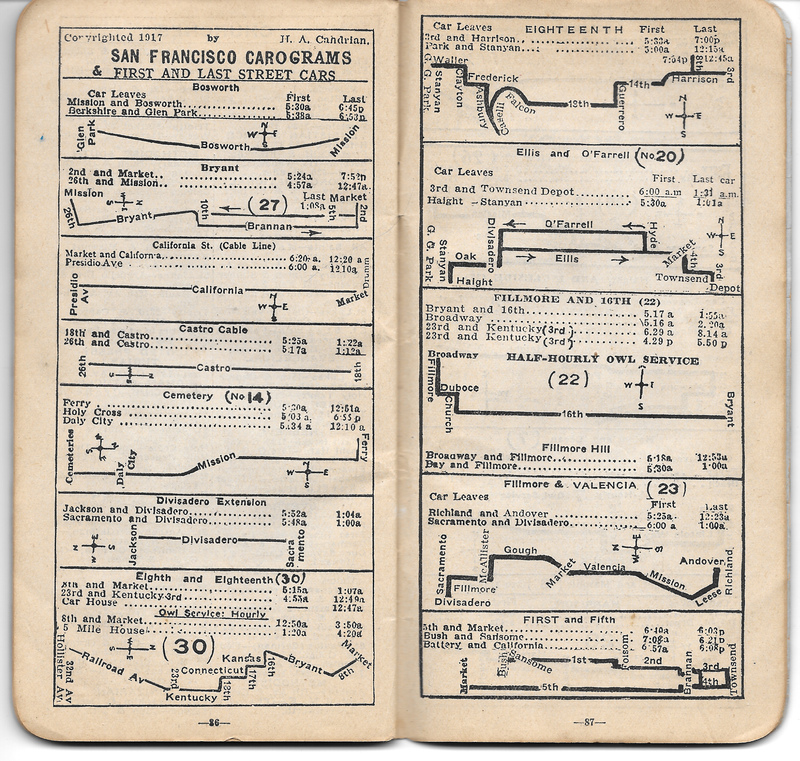 In 1917, map publisher Herman Anton Candrian (1862-1928) introduced a novel graphical representation of streetcar lines for San Francisco’s transit riders that he called Car-o-Grams. These little glyphs made streetcar data visual and succinct. 1917c. 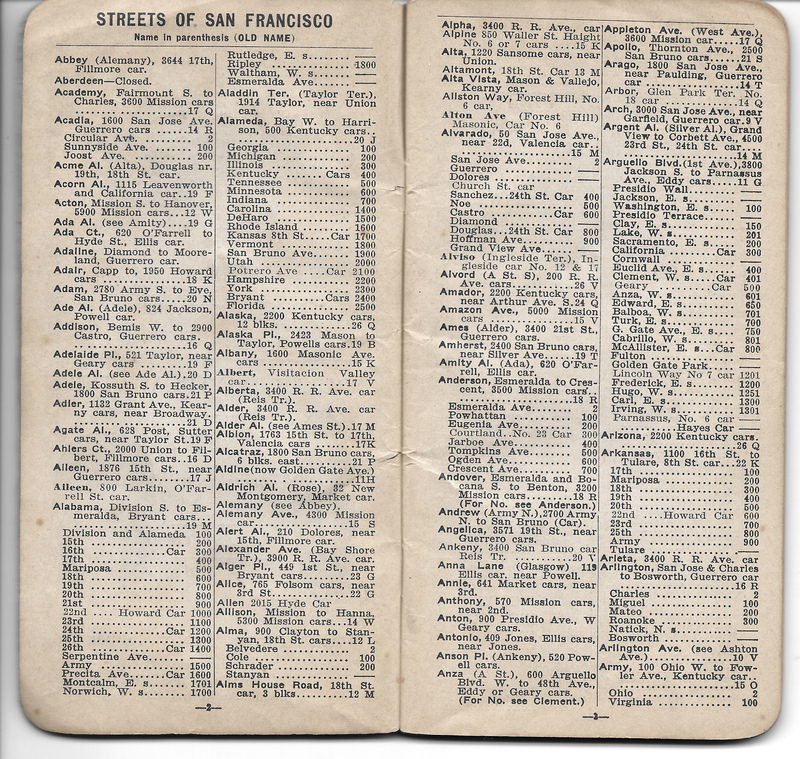 Candrian’s Double Indexed Guide and Map of San Francisco and Daly City with Car-o-Grams. Pages 86-87. Note copyright. View larger. Candrian’s company had been publishing city maps with transit routes since at least 1906. 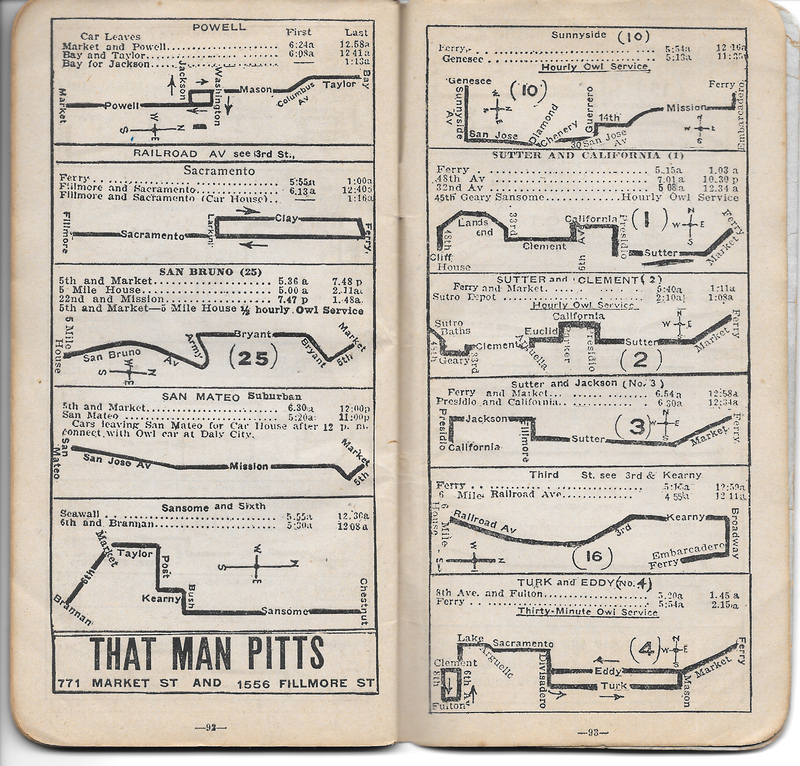 Every map had an accompanying pocket-sized booklet that indexed all the streets and gave streetcar information for each. 1917c. Candrian’s Double Indexed Guide and Map of San Francisco and Daly City with Car-o-Grams. Front cover. “Candrian’s Guides” 2350 Market Street. About 1920. Image courtesy Joy Candrian. Herman Anton Candrian is the man on the steps. 1917c. Candrian’s Double Indexed Guide and Map of San Francisco and Daly City with Car-o-Grams. Pages 2-3 of the index portion, showing map coordinates. View larger. Imperfect English, sure, but Candrian was an immigrant like much of the city’s population. He came to the US from Switzerland in his teens and moved to SF in the 1890s. Perhaps he had a frustrating experience on the streetcars, and vowed to make it better for others. The streetcar diagrams fit onto ten small pages. 1917c. Candrian’s Double Indexed Guide and Map of San Francisco and Daly City with Car-o-Grams. Pages 88-89. View larger. 1917c. Candrian’s Double Indexed Guide and Map of San Francisco and Daly City with Car-o-Grams. Pages 90-91. View larger. 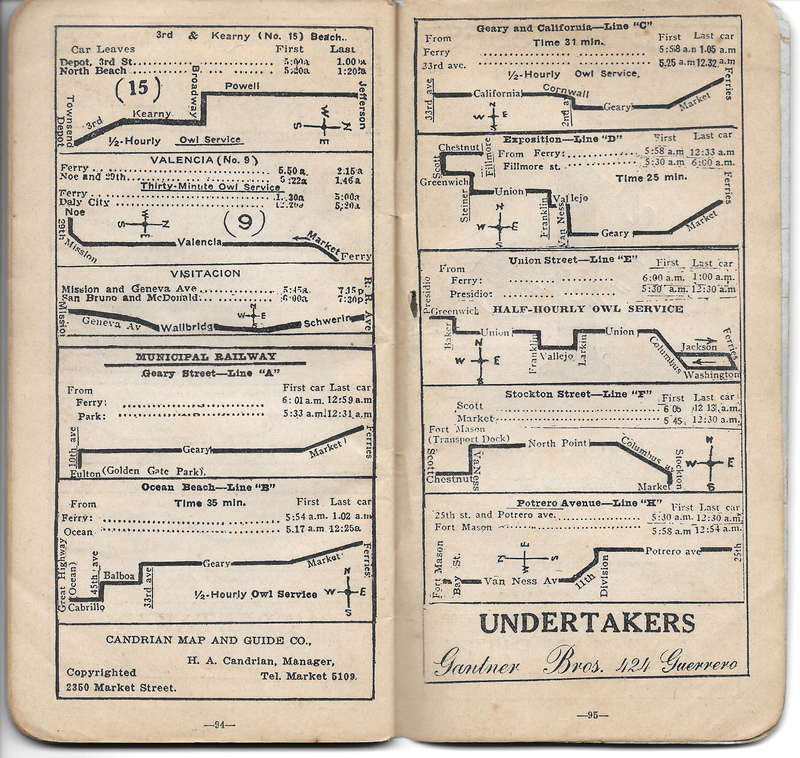 The 1917 booklet was the first to include the new little route maps for all the lines, both those cars run by United Railroads of SF and the burgeoning Municipal Railway. MUNI had only lines A to H then, but would soon add the J-Church. Then in 1918 it opened the Twin Peaks tunnel, used by the K, L, and M cars. 1917c. Candrian’s Double Indexed Guide and Map of San Francisco and Daly City with Car-o-Grams. Pages 92-93. View larger. 1917c. Candrian’s Double Indexed Guide and Map of San Francisco and Daly City with Car-o-Grams. Pages 94-95. View larger. The graphics weren’t top-notch, but the information was right and included first and last cars. At thirty-five cents it was more in equivalent dollars than a MUNI map today, but probably lasted longer. 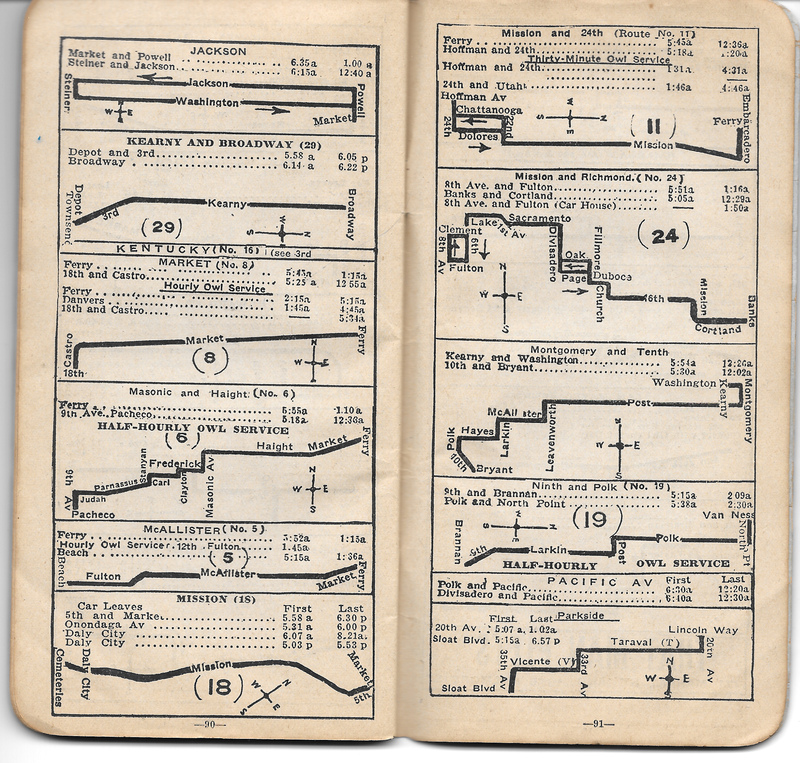 These squiggles (which might be called Tufte Lines) presaged the Market Street Railway diagrammatic guide to its cars, published January 1927, which may well have infringed on Candrian’s copyright. The Market Street Railway effort was truer to cardinal directions, and a neater piece of work, but Candrian’s idea predates it by ten years. Candrian’s company published the maps at least through the early 1930s. 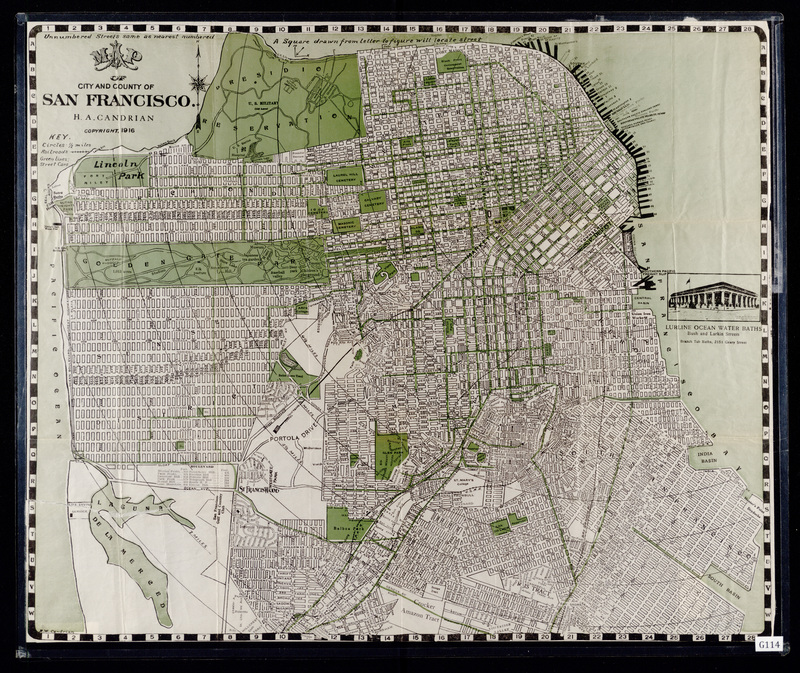 The 1916 map that would have accompanied the 1917 Car-o-Gram booklet has just been digitized by the Sutro Library (link coming soon). 1916. Map of City and County of San Francisco. HA Candrian. Image courtesy of the Sutro Library branch, California State Library, San Francisco, California. View larger. The Candrian maps are not stellar work. (Links below to other versions.) They abound with paper streets and bad data. Here is a portion of the 1916 map, where the new Glen Park streets are sketched in over the would-be parkland that the Crocker Estate was at that time. 1916. Candrian map, portion. Image courtesy of the Sutro Library branch, California State Library, San Francisco, California. The map printed in 1932 (link below) was rife with sloppy map-making, at least in my end of town. On this one, Mount Davidson’s curvy new lay-out is butchered, included an apparently last-minute addition of something called “San Martin” which never existed, on or off paper. Havelock is blithely and erroneously extended through Balboa Park, and a neighborhood called “Westgate Park” appears in the vicinity of the present Mt Davidson Manor. By then Candrian had passed away. Still, for its time, the combination map and booklet put a lot of data in the pocket of the user. Candrian also published map-booklet sets for Oakland and Los Angeles. 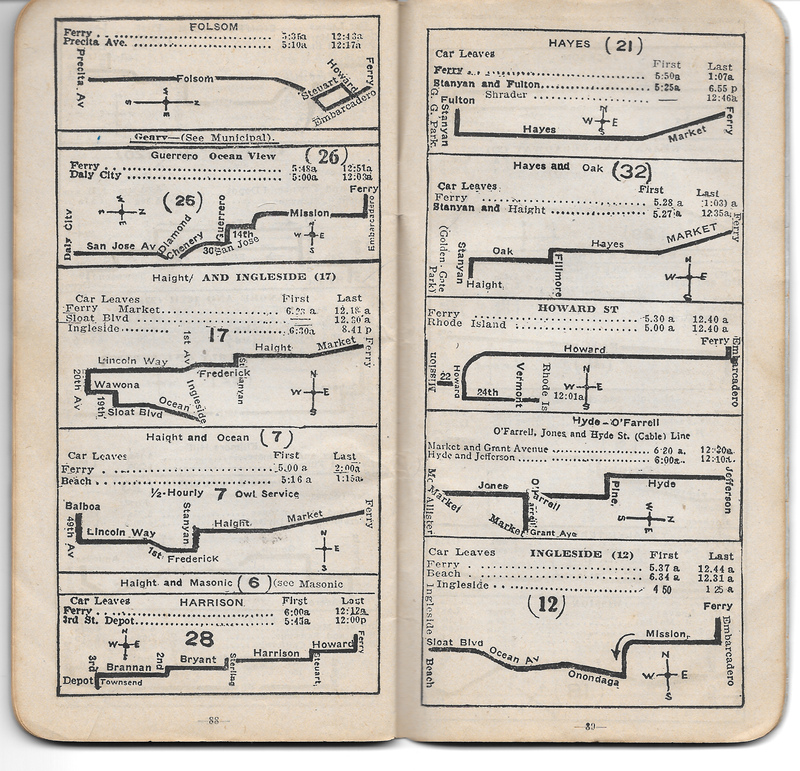 When automobiles were increasingly being used, they published road book for motorists, and in 1921 they used the ‘Grams’ idea to create ‘Auto-grams’ for automobiles’. Thanks to Andrew Sherman for one of the nicest birthday gifts ever.